One of my current go-to recipes at the moment is a simple bolognaise sauce with kangaroo, served on sweet potato noodles. 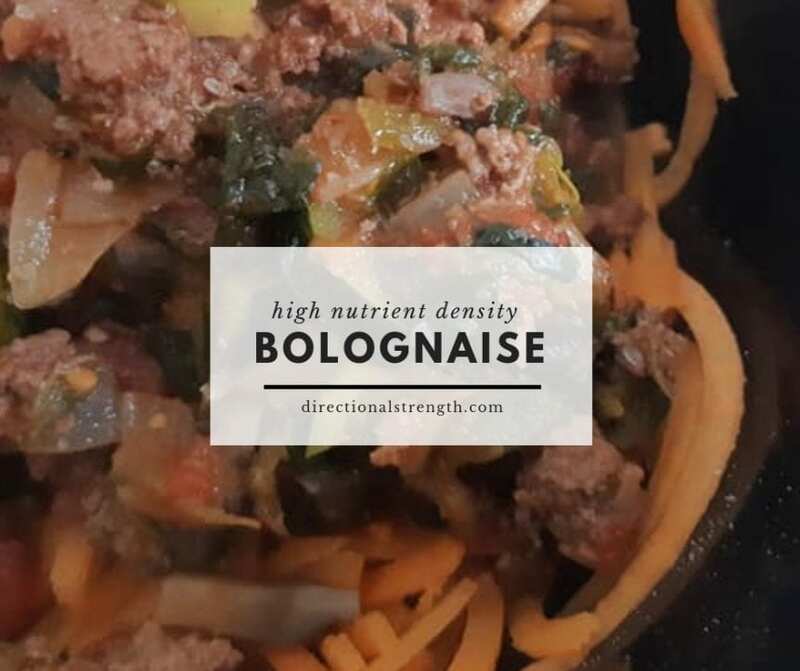 I’ll make this twice a week in bulk and then have one serve a day, so it’s really easy to grab when I need something quick, but it’s also packed full of phytonutrients, vitamins, minerals and nutrition. Each serving gives you all of your daily Vitamin A & K, 3/4 of your daily intake of vitamin C and around 1/3 of your daily intake of B vitamins, iron, magnesium and potassium. Each serve has only 300 calories but 30g of protein, 40g of carbs and very little fat, so it’s versatile for post workout or any other main meal. If you need less carbs, use zucchini noodles instead. If you need more fat, add oil, cheese or avocado. Add a small amount of oil or butter to a hot pan and then begin frying the onion and garlic. Slowly add in the other vegetables and cool until they have all begun to brown and sweat. Add the herbs and mince and then continue cooking until the meat has browned, then add the tomatoes and stir occaisionally for a few minutes or until the water has begun to evaporate. Serve on your choice of rice, sweet potato/zucchini noodles or pasta. Nutritional info given is based upon 1/2 a pack of sweet potato noodles (available from Coles in the salad section).